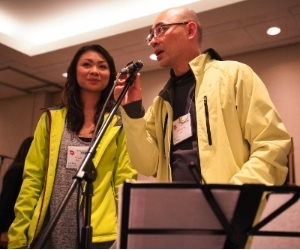 Grace Lee helped her father Lawrence Lee to organize the Canada Chinese Christian Winter Conference. 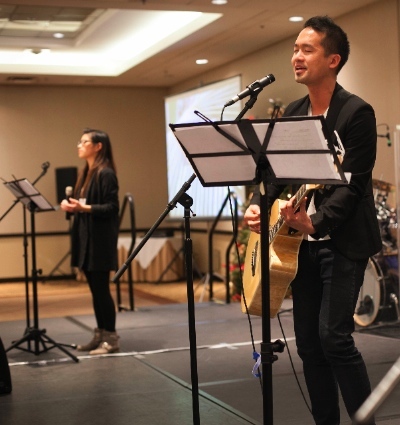 It is now 53 years since a movement of western Canadian Chinese Christian students started a winter conference between Christmas and New Year’s. It was an opportunity for fellowship and community, as well as a chance to meet with and listen to some of their first generation Chinese-Canadian leaders. The students were mostly from Christian families and worshipped in churches that were composed mainly of immigrants from Hong Kong and their children. The students that led the movement were both respectful of their elders and interested in growing in their own Christian faith as they studied in western Canada’s public universities and colleges. 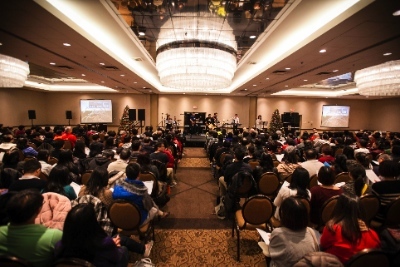 The 53rd Canada Chinese Christian Winter Conference (December 27 – 31) drew about 600 people to the Sheraton Guildford Hotel in Surrey. There were some subtle differences between the first and 53rd, according to conference planning committee chair Lawrence Lee, a financial planner. The main difference, he suggests, relates to the demographics. While the early conferences were attended largely by young students, today the crowd is roughly split – one-third teens and 20s, one-third 30s and 40s and the remainder over 50. Also, the language makeup is different because, unlike the originators, Hong Kong immigrants who spoke Cantonese, many of the present attenders come from the ‘mainland,’ where Mandarin is spoken. One reason for the changing demographic, he suggested, ”is that second and third generation people now come and the first generation are there,” in part because of the chance to renew spiritually along with their progeny. His own family is one example. Grace, his daughter, assists him in coordinating the conference. Asked if Chinese-background people who attend predominately Caucasian or multi-ethnic churches are a large part of the conference, he said not so much. The denominations with which most attenders identify are Mennonite Brethren, Baptist and Alliance. Lee says most of the attenders come from western Canadian provinces and the northwestern United States. A counterpart winter conference ran for some years in Toronto, but is currently dormant, he adds. Attendance has ranged “from a high of 1,600 to a low of 400” during the 53 years, Lee says, indicating that things are currently on an upswing. While the leadership is predominately Chinese, the conference organizers include speakers – particularly in the English track – drawn from non-Chinese Christian leadership. Tom Blackaby, part of the family of Baptist leaders whose ‘patriarch’ Henry Blackaby wrote the Experiencing God books and study guides that circulated millions of copies in the 1990s. Cynthia Cavanaugh, a life coach whose experience of depression has reshaped her ministry. The kinds of questions posed by some of her workshop attenders indicated that she was able to speak into the ‘shame’ culture that marks the lives of some younger Chinese background people. Gabriel Chen, a lawyer involved in providing legal aid in a homeless outreach ministry in Calgary. Rick Lamothe, a former Ottawa pastor, now international regional director for Operation Christmas Child. Samuel Voo, English pastor at New Life Lutheran Church in Vancouver. Carmen Rempel, who works with Youth Unlimited, helping direct troubled teens “toward the light of Jesus.” The conference program noted she is currently training for her first marathon. The conference exhibitors, too, indicated something of the connections that various ministries like to make with the Chinese Christian community. A Rocha (a Christian environmental awareness ministry), Breakthrough Missions Canada, Carey Theological College (which has a Chinese ministry education arm), Alpha Canada, Vancouver Chinese Christian Short Term Ministry Training Centre and Inter-Varsity Christian Fellowship, were among them. All photos courtesy of Canada Chinese Christian Winter Conference.